Skyros took its name from its rocky terrain. According to the testimony of the ancient authors, the island was occupied successively by Pelasgians, Karians, Cretans, and Dolopians. The movements of tribes at this period probably find an echo in the legend that Thetis, the mother of Achilles, hid her son at the court of Lycomedes, king of Skyros, to escape the prophecy of the Delphic oracle that her son would be killed at the siege of Troy. The myth of Theseus, who settled on the island to escape the hostility of the Athenians, and was killed there, probably reflects the departure of Ionians from Skyros. Traces of human activity have been found dating from the Neolithic period. About 470 BC the island was captured by Kimon, who expelled the Dolopian inhabitants and settled Athenian cleruchs there. Skyros, along with Limnos and Imbros, was a valuable staging post in communications between Athens and the Hellespont. 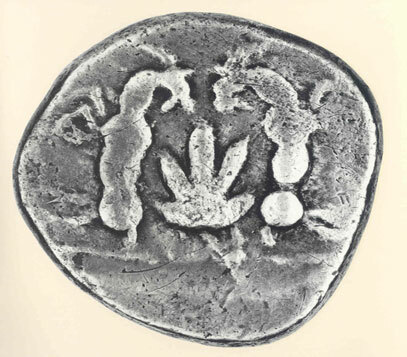 The output of the Skyros mint was small, and her coins are rare. The silver issues of didrachms (middle of the 5th c. BC) depict a fig-leaf between two goats on the obverse and a star-shaped floral ornament in an incuse square on the reverse. The depiction of the fig-leaf and goats not only has reference to the local cults, but is in complete harmony with the products of this rocky island.